GW: What attracted you to Sword and Sorcery? What made you want to write it yourself? 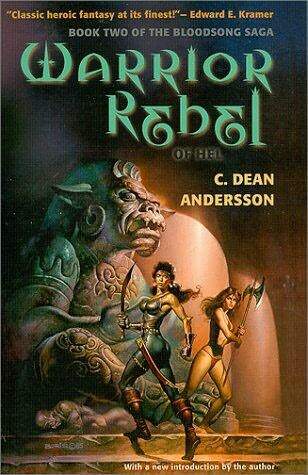 CDA: I developed a love for Science Fiction at an early age, and among the books I remember enjoying most were Edgar Rice Burroughs’ A Princess of Mars, Poul Anderson’s Three Hearts and Three Lions, and Robert Heinlein’s Glory Road. But full-out Sword and Sorcery hooked me when, the night after I read my first Robert E. Howard Conan story in one of those famous Lancer paperbacks with a glorious Frazetta painting on the cover. 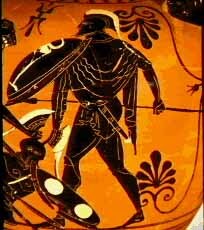 I woke from a dream in which I was stalking over bleak, fog-shrouded hills holding a sword aloft and yelling, "Crom!" Talk about making an impression! 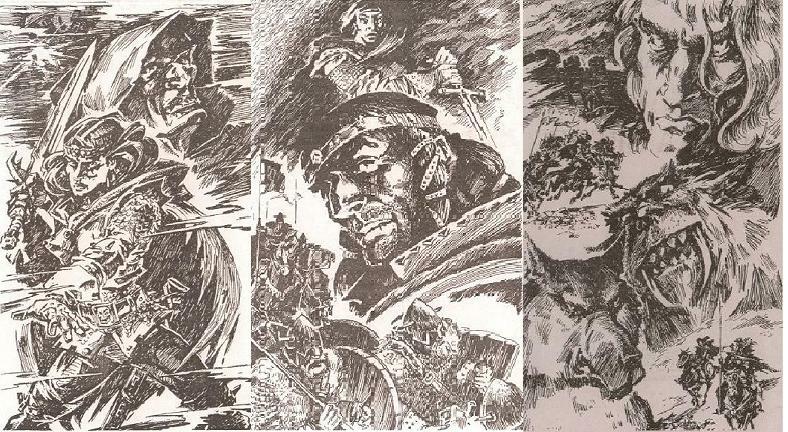 But I didn’t think of writing my own Sword and Sorcery tales until I discovered Michael Moorcock’s Elric stories, in particular Stormbringer. The first novel I wrote was very Elric-esque. I even drew a map for it with place names as unpronounceable as I could make them and sent the manuscript and map to a publisher, who sent them back with an encouraging note. That first novel was never published, but I kept trying. Persistence, or pure never say die stubbornness, is one of the most important qualities a writer, beginning or otherwise, can have. Making that first professional sale is wonderful, but it’s only the beginning. GW: Your Sword and Sorcery trilogy about the Viking warrior woman Bloodsong was first published under the name Asa Drake. Why the pseudonym? CDA: The Bloodsong books were not my first published novels. That honor goes to two books I co-wrote for Avon Books with an already published writer, Nina Romberg, who writes under both her own name and as Jane Archer. The Avon editor wanted a pen name to represent the two of us. Asa is a man's name in some cultures, a woman's in others, and Asa is the name of the vampire-witch portrayed by the glorious Barbara Steele in one of my favorite horror films, Mario Bava's Black Sunday, also known as Mask of the Demon. As for Drake, it can mean Dragon, the root word in Dracula. Those things were meaningful with regard to the first Asa Drake novel, Crimson Kisses, because it is one of the earliest fictional versions of how the historical Romanian national hero, the warlord Vlad the Impaler, became Bram Stoker’s Count Dracula. Avon published it in 1981. GW: You wrote about Dracula again in another book, didn’t you? A: Yes. I reworked and expanded Crimson Kisses as I Am Dracula under my own name. Kensington published it in 1993 and reprinted it in 1998. It remains one my most popular titles. One loyal reader wrote he read the novel more than thirty times. Others have also mentioned multiple readings. That’s very heartening. Even a reader from Dracula’s Romanian homeland gave it a positive review at Amazon online. I appreciated that welcome feedback! GW: And the second novel you co-wrote as Asa Drake? CDA: The Lair of Ancient Dreams is a historical Lovecraftian horror-fantasy about Lamashtu, a Sumerian Goddess forced to become a Demoness when invading male deities usurped her power in ancient times. A man and a woman on the run from the Inquisition become her prey and discover they are reincarnated Sumerians who once worshipped her as a Goddess. Either they find a way to restore her Goddesshood, or the Demoness she has become will destroy them. Fantasy novels that employ a Goddess theme are not uncommon today, but in 1982 when Avon published The Lair of Ancient Dreams, they were rare. 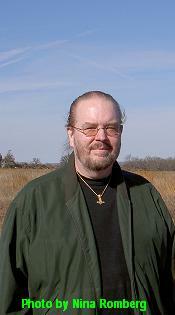 GW: When you later wrote the Bloodsong trilogy on your own, you still used the Asa Drake name. Why? CDA: The editor who bought the Bloodsong trilogy advised me to use the fantasy genre pen name that had already been published. Nina did not object, and I agreed. GW: The Bloodsong trilogy was originally published in 1985 and 1986 by Warner Books. New editions were published in 2000 by Hawk Books, but under different titles and under your own name. How did that happen? CDA: Hawk Books asked to republish the trilogy for its fifteenth anniversary. For the new editions, I wanted to use my own name. The publisher requested new titles. 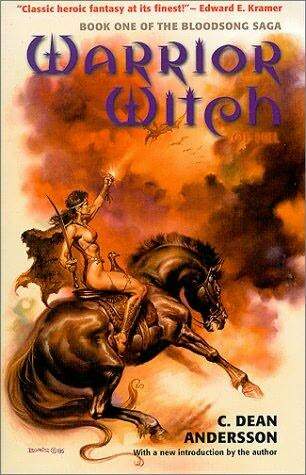 Warrior Witch of Hel became Warrior Witch, Death Riders of Hel became Warrior Rebel, and Werebeasts of Hel became Warrior Beast. GW: How do you like the new editions? CDA: They are excellent editions in a trade paperback format, larger than the mass-market originals. I enhanced the text by adding special introductions about the writing of each book and how my Swedish heritage and lifelong studies of Scandinavian lore influenced them. GW: Bloodsong is a warrior woman. Why did you choose a female warrior as the main character? CDA: Readers who first meet Bloodsong in the new editions often think the books were inspired by the Xena: Warrior Princess TV series. They don’t realize I created Bloodsong ten years before Xena, when Sword and Sorcery novels featuring a female hero as the main character were few and far between. I wanted to create something new, a warrior woman fundamentally different from traditional heroic fantasy heroines like Red Sonja, Valeria, and Jirel of Jorey. Bloodsong does not seek adventure, riches, or glory. By making a deal with the Norse Death Goddess Hel, she has come back from the dead to save her daughter’s life. Helping Hel regain stolen powers in the process endangers all life on Earth, and Bloodsong has to deal with the consequences of her actions as the trilogy progresses. But her daughter, family, and friends always come first, and no matter how overwhelming the odds, she never gives up. The war cry of her followers is, "Bloodsong and Freedom!" GW: Have you ever considered continuing Bloodsong’s story beyond the third book? CDA: I am writing a new Bloodsong novel now. And I wrote a short story about Bloodsong that takes place after the end of the third book, "The War Skull of Hel." You can find it in the Michael Moorcock-inspired anthology, Pawn of Chaos: Tales of the Eternal Champion. It was only right that Bloodsong partner in that story with a character created by Moorcock, the writer who inspired my own Sword and Sorcery and Bloodsong. 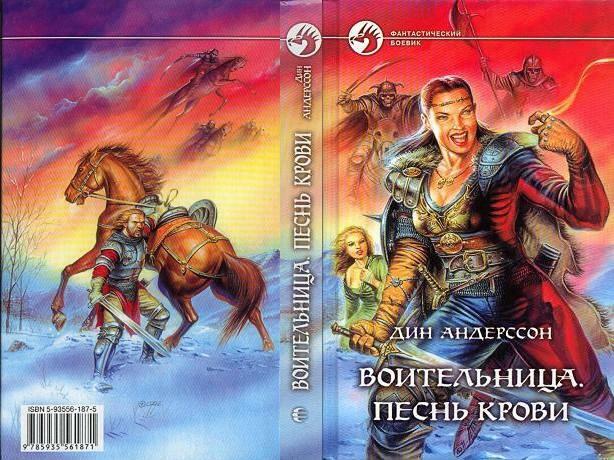 GW: The Bloodsong trilogy also has Russian editions. How did that happen? 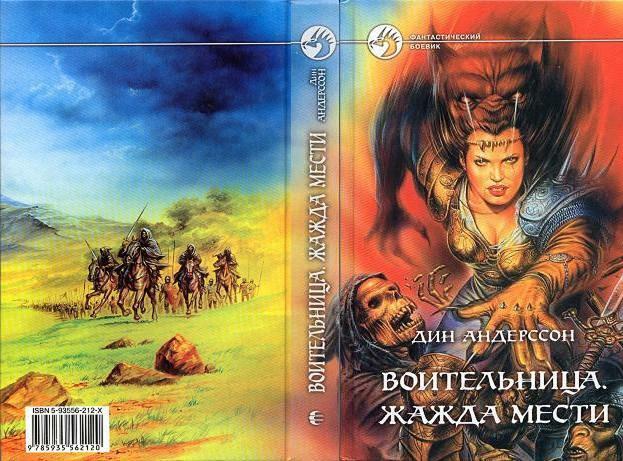 CDA: I sent a set of the Hawk editions to my Russian agent, and in 2002 Alpha-Kniga released the trilogy in Russian language hardbacks. They used excellent artwork that accurately portrays the way I describe Bloodsong in the books, complete with battle scars and Odinic Runes around her throat. Ilia Voronin painted the three wrap-around covers, and Konstantin Pravitskiy created each book’s endpaper and frontispiece art. GW: Speaking of art, the covers for both the Warner Books and Hawk Books editions are by Boris Vallejo. How was it, working with Boris? CDA: I was thrilled when Warner Books commissioned him to create Bloodsong's covers. I was already a fan of his art. Hawk bought reproduction rights from him for their editions. His Bloodsong paintings are even more beautiful in Hawk’s larger trade paperback format. He later used the first painting in one of his calendars. He used the first and second paintings in trading card sets, too. And all three are now available as prints on his official website. There's a story about the third cover. Boris called me one morning while he was working on the cover for Werebeasts of Hel. It had been communicated to him that the publisher's art director wanted a water buffalo on the cover. To his credit and my gratitude, Boris had read the book and knew it was set in the frozen north during the dead of winter with no water buffaloes in sight. It turned out that there had been a serious miscommunication. The art director had requested that the werebeast on the cover be "hulking like a water buffalo." But the "hulking like a" part had gotten lost. I really appreciated Boris going above and beyond to clear that up. No water buffaloes! GW: How about other fantasy artists? Favorites? CDA: Beyond Boris and of course Frazetta, I’d list Julie Bell, Brom, Rojo, Rowena, Elmore, Whelan, lots of others. I've worked as a professional artist myself, so on my website I make a point of giving artists credit for my book covers. GW: Most of your work other than the Bloodsong Saga would be classified as Horror. CDA: Yes. The first books under my own name were horror novels. I worked with the editor of the Bloodsong trilogy on them. It wasn’t much of a leap from the strong horror elements in the Bloodsong books and earlier Asa Drakes to contemporary horror. After the two I wrote for Warner Books I wrote others for Kensington. And I’ve had a number of horror short stories published in various anthologies. GW: Do you write as much fantasy as you would like? How does mainly being known now as a horror writer affect your fantasy? Or does it? CDA: It really doesn’t affect it. I like mixing genres, and whatever I write tends toward the dark side, but my characters defy that darkness and, no matter how overwhelming the odds, never stop fighting back. There’s a little Bloodsong in all of them. GW: The 1960-70s were the hey-day of Sword and Sorcery. 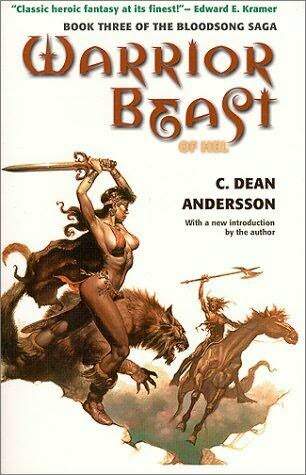 Can an author actually sell S&S, outside of the Conan pastiches, any more? CDA: I believe selling S&S is easier than it was a few years ago. There are new avenues for publication, specialty presses, e-pubs, self-pubs, print-on-demand houses, and so on, not to mention the gaming publishers that release good S&S stories set in their shared world realms. But even with the traditional NYC publishers, in spite of all the mergers shrinking the number of houses and the reduction in mid-list titles, I believe there is a better chance of selling a Sword and Sorcery novel because Fantasy has become a bigger market after Peter Jackson's Lord of the Rings and J. K. Rowlings’ Harry Potter had such success, bringing new Fantasy readers to the market. The same kind of boost in publishing occurred in Science Fiction after Star Wars hit big in 1977. You can also see the increased acceptance of Fantasy in the Romance market these days. Romance writers now incorporate Fantasy and Paranormal elements into novels featuring action-oriented heroines who are spies, cops, Buffy-esque vampire hunters, anything you can imagine. The Paranormal Romance sub genre is a hot market. I applaud and enjoy the books that are being written for that sub genre. We might even see Sword and Sorcery in a Romance line one of these days. Keep your eyes open. GW: Who inspires you in Fantasy today? Favorite S&S authors? CDA: The same Fantasy writers who used to inspire me still do. Always Robert E. Howard and Michael Moorcock, but also Fritz Leiber, Lin Carter, C. L. Moore, Andre Norton, L. Sprague de Camp, Leigh Brackett, Gardner Fox, Fletcher Pratt, Edgar Rice Burroughs, and many more. In Norse Fantasy, though, you simply can’t do better than late Poul Anderson’s work, Mother of Kings, The Broken Sword, Hrolf Kraki’s Saga, and his masterpiece, in my opinion, War of the Gods. 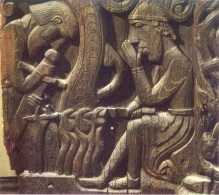 Diana Paxson’s Woden’s Children series, based on the Germanic national epic Ring of the Nebelungenlied or its Scandinavian counterpart, The Volsunga Saga, is excellent, as is Stephan Grundy’s novels on the same subject. I enjoy Richard Lee Byers heroic fantasy work a great deal. There’s also Leonard Carpenter, his take on Conan is a favorite, and Chris Claremont, Elizabeth Moon, Sharon Greene, C. J. Cherryh, Mercedes Lackey, and lots of others. What great time this is, to have so many fine writers working in the field. But a special mention goes to the late Robert Adams and his Horseclan series. He befriended me and many other writers at the start of their careers. At SF conventions his rooms were a welcome meeting place for mutual friends where you could relax, enjoy good conversation, and listen to Bob tell stories. He knew anyone you could name, it seemed, and had a story about each. Better yet, reading his books is like hearing him spin a yarn in person, the mark of a true storyteller. If there’s a writer’s Valhalla, I’ll bet Bob Adams is sitting at the head table right now, his voice booming out, a mischievous twinkle in his eyes, telling stories! GW: What are your most recent books or stories? CDA: I have three short stories, "Odin’s Swallow," "Daddy’s Dinner," and "Hang Tuff" in the Small Bites charity anthology whose proceeds benefit the veteran horror writer Charles Grant’s medical fund. "The Tomb of Fog and Flowers," a story about Dr. Van Helsing from Bram Stoker’s Dracula, is in The Many Faces of Van Helsing, an anthology on the final ballot for the Horror Writer Association’s Bram Stoker Award. And my "Dust Bowl" is one of the zombie stories from The Book of All Flesh under option for a movie. I’m looking forward to seeing it on the screen. It’s about two good old Texas zombie hunters forced into a flesh-eating zombie football game. Heads do roll, along with other things. GW:. What's next for C. Dean Andersson? CDA: More Bloodsong novels, more Horror novel, lots of short stories, and whatever else comes along that I feel deserves a story. GW: Where can readers buy the Bloodsong trilogy and your other novels? CDA: The usual places online, of course. Or, if they want to buy new copies signed, they can use the contact email address at www.cdeanandersson.com to inquire about availability and prices. GW: Thanks for answer all my questions. CDA: Thanks for asking. You’ve got a fantastic website devoted to what is obviously one of my favorite genres. I’m honored to have Bloodsong, and myself, be a part of it. Long live Sword and Sorcery and those who love it! Bloodsong and Freedom!